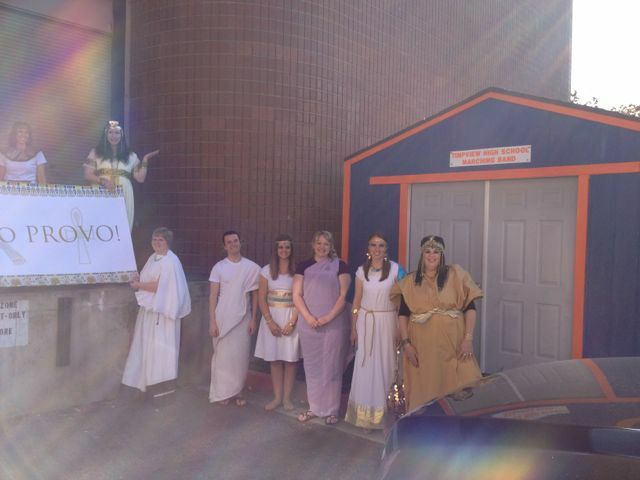 It's not often I pull up to a stage door and find the entire pantheon of Egyptian gods waiting to greet me. Last night in Provo, Utah, the Egyptians were out in force! The folks you see in these shots are staff or volunteers for the Provo Library, and boy do they know how to put on a party. 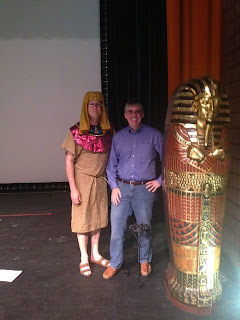 That's me, below, with Gene, the library director -- er, I mean, pharaoh. We took over the auditorium of Timpview High School and filled it to capacity with 1500 people who were very, very excited (and loud!). 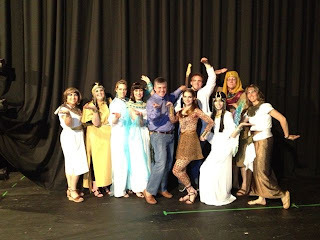 The show started with a sing-a-long and dance led by Isis, Bast and Thoth, who you can see in the group shot below. The staff had rewritten the words to "Walk Like an Egyptian" to honor Carter and Sadie. Pretty amazing. 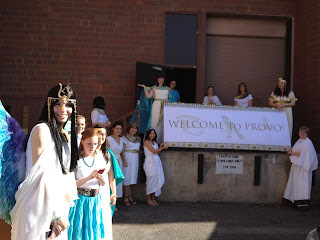 The Egyptian gods walked through the crowd, giving out signed books as prizes to the best costumes and best dancers. That certainly got the crowd going! 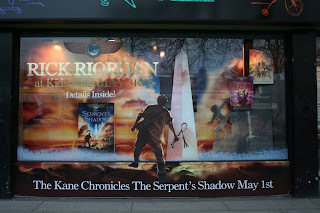 I read from The Mark of Athena, talked about the Kane Chronicles, and answered lots of terrific questions from the audience. I'd been to Provo once before and had a blast. This makes it two for two. One girl in the audience was literally bouncing up and down for the entire hour. Upon hearing the news that I would be writing a Norse series, another young fan jumped into the aisle and did the happy dance, really busting out the pro moves. And the costumes -- wow! Everybody was dressed to the nines, or is it 'dressed to the nomes'? Thanks everybody for coming out! Today, I'm off to Vancouver for another sold-out event with KidsBooks. Can't wait to revisit Frank Zhang's hometown! Check out the amazing storefront window Vancouver KidsBooks has done for my visit.